First spotted by the Voyager spacecraft thirty years ago, it wasn’t until Cassini that the linear features criscrossing Saturn’s moon Dione known as “wispy lines” were confirmed to be the icy faces of high cliff walls rising hundreds of feet from the moon’s frozen surface. Possibly caused by tectonic activity Dione’s cliff walls shine brightly in the sunlight, being made of reflective water ice and too steep for darker surface material to build up upon. The image above was taken on December 20, 2010, by the Cassini spacecraft at a distance of about 67,000 miles (107,000 km). The view is of the trailing side of Dione, which, like many moons, always keeps one side facing toward its parent planet as it orbits. 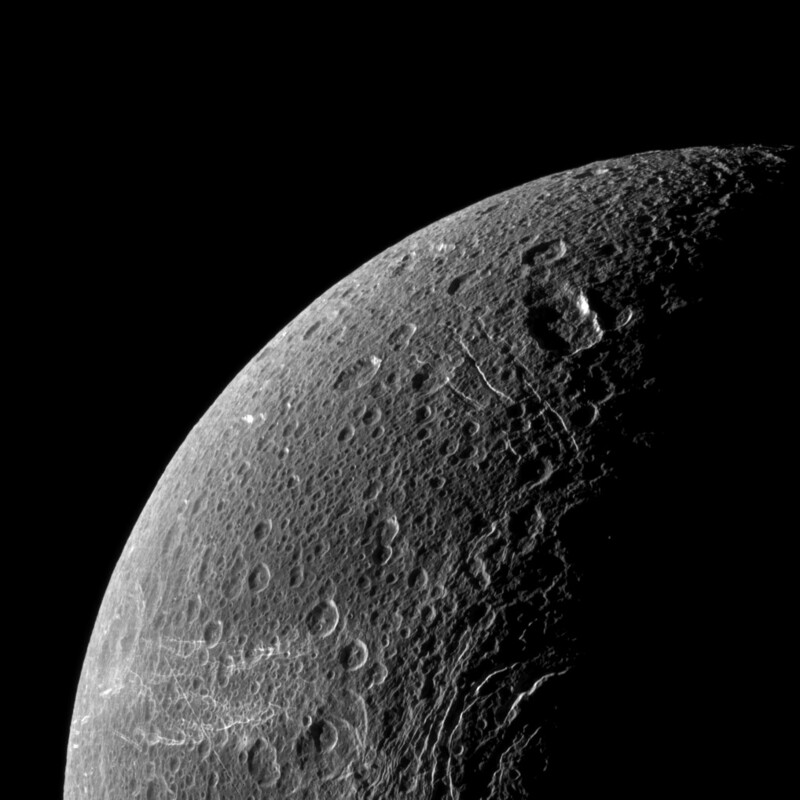 Dione is 698 miles (1,123 km) wide. It is about as far away from Saturn as the Moon is from Earth. See the full release and more images on the Cassini Imaging Lab site here.